Date night changes yet again. One of these days, I’ll actually work at a place and on a set schedule for more than a few weeks. If you’ll remember, I changed jobs about two months ago. It didn’t really work out the way I would have hoped and my old place of employment made me an offer to get me to come back. When I put in my two weeks at the place I was working at, they pretty much kicked me out of the door so I’ve been on the beach for the last three weeks waiting until I could start at my old job. The start date is tomorrow morning which also coincides with a trip that J will be taking without me. She’s going to New Orleans for the weekend to catch up with some friends from her first job in Idaho Falls. The only chance we were going to have to have our “date night” this week was actually lunch today. A few weeks ago, I got a tweet from someone who suggested we try the Kansas City Dip ‘N Grill. I had heard of the place but I wasn’t so sure it was still open. 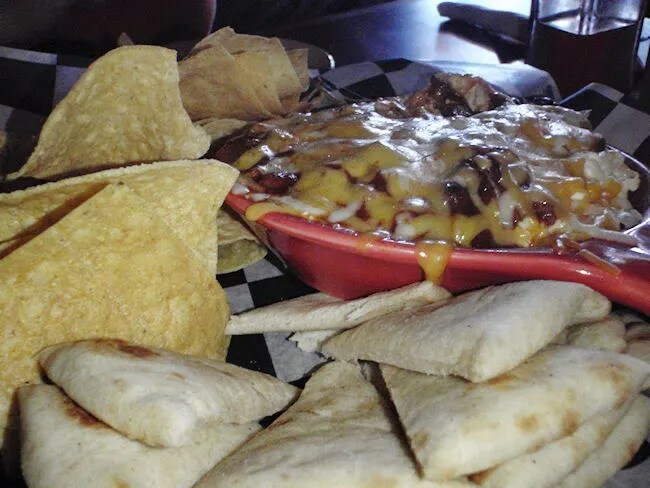 I did a Google search and eventually figured out the place no longer existed….but the family that owned Kansas City Dip ‘N Grill stayed in business, changed the name, revamped the menu, but kept some of the dips. 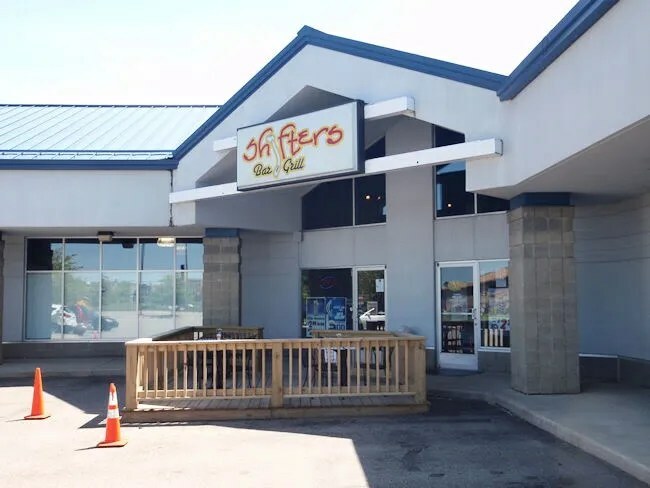 The new business is Shifters Bar and Grill on West Main Street (in the old Kansas City Dip ‘N Grill building) just to the west of Ninth Street. It’s sort of hidden from Main Street as it sits in a strip mall that’s really hard to see as you’re driving by at 50 MPH. If you’re familiar with the area, it’s right next to the Seelye Wright Toy Store. By the time we got around to lunch, I was starving. My tummy was just a constant rumble. We pulled in to the parking lot just after 2:30. Not a real hot time for lunch. When we got in to the pub, we saw a sign that said wait to be seated. Seemed kind of odd because the place was empty…still, we waited like we were told. After a few minutes, a waitress came out of the kitchen to answer the phone. She saw us standing there and told whomever she was talking to she had to go because there was someone waiting. She then told us to sit wherever we’d like. 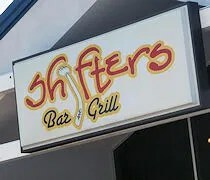 The bar has the name Shifters because it has a car theme. There are quite a few NASCAR themed decorations hanging on the wall as well as a door panel of a short track car that they sponsor(ed). The menu is pretty large and pretty daunting the first time you look at it. J and I got a Coke and a Sprite but still needed a few minutes to look over everything when our drinks came out. I knew I wanted a burger. What else is new? I passed on the Black & Bleu Burger and went with the Hickory Burger instead. The patty is a steak burger that I had cooked medium. It’s topped with BBQ sauce, bacon, and cheddar cheese. There was just enough BBQ sauce on the sandwich that it was almost, but not quite messy. The sauce was a thick sweet sauce which I really like. The bacon was crispy but not overcooked. I had the burger cooked medium and it came out just slightly pink in the middle, but it’s still a lean steak burger which has a tendency to be a little dry. 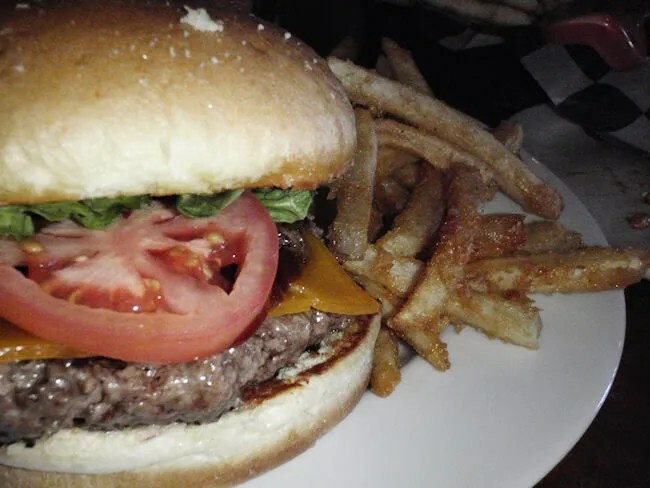 The burger was still very good and exactly what I was craving. The sandwich came with beer battered fries on the side which needed a little more salt. They were very crispy and very golden brown. Just the way I like fries. J decided she wanted one of the dips, but she also wanted one that I would share with her. We didn’t know exactly what to expect so she ordered the Chili Cheese Dip. Like most of their dips, it’s a cream cheese base with homemade chili and cheddar cheese on top of it. It’s served with tortilla chips and pita wedges in a ceramic dish. The dip came out before my sandwich did so I happily helped her with the dip. I was a little surprised at just how good it was. The homemade chili was a chunky chili with ground beef, beans, and jalapenos among other things. We were both trying to be proper at first and taking dip out of the dish and putting it on our plates, but hell, we’re married. It was easier just to dig in. The only comment J made was that she thought the dip was delicious and liked that it came with pita wedges as well as tortilla chips. 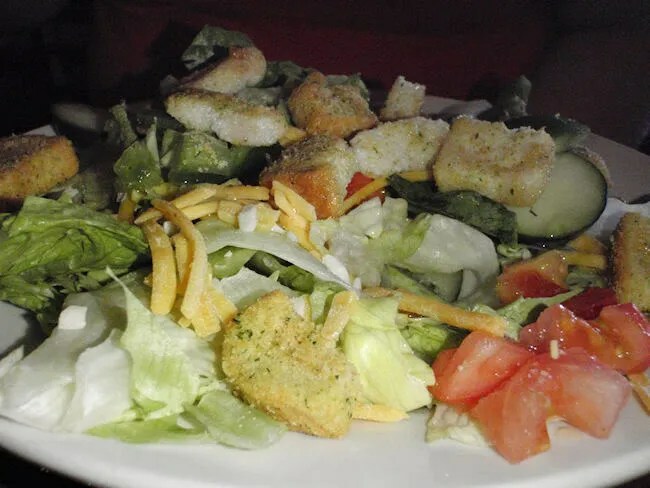 To compliment the dip, J also ordered a House Salad with a vinegar and oil dressing. She got a lot more salad than she was expecting. It was a simple mixed greens bed with various vegetables. She only ended up eating about half saying the bowl was much deeper than it appeared to be. Our bill was a little over $25. The dips are all priced as entree’s so it can be a somewhat expensive night. They do have a dip sampler platter which lets you try three dips for about $13. The food we had was all pretty good. It’s typical pub fare with a little bit of a twist. Having never been to Kansas City Dip ‘n Grill, I don’t really know how much is left over from those days, but I do like the idea of the restaurant. I have no idea what happened to the chain as it looks like all the West Michigan locations that used to be Dip ‘N Grills are now something else, but I like that this family opted to keep the concept going. It’s definitely something different.